Women have had to fight for equal treatment in politics in the United States by winning the right to vote and a seat at the political table. The Nineteenth Amendment to the Constitution gave women the right to vote. Gender stereotypes about female politicians and voters still exist. Since gaining the right to vote in 1920, women have worked in many levels of government in the United States. In 1981, President Ronald Reagan named Sandra Day O’Connor as the first female Supreme Court justice. Currently, three of the nine sitting justices are women. Despite the increasing presence of women in American politics, gender stereotypes still exist. Data from the 2006 American National Election Studies Pilot Study showed that voters of both sexes, regardless of their political persuasions, expected men to perform better as politicians than women. Because gender is considered to be a master status, “women” are considered to be a political demographic. In other words, “women” are supposed to have certain political priorities (usually those having to do with children and education) that unite all women as a voting bloc. voting bloc: A group of voters that are strongly motivated by a specific common concern or group of concerns to the point that such specific concerns tend to dominate their voting patterns, causing them vote together in elections. women’s suffrage: The right of women to vote. master status: A social status that is the primary, socially-identifying characteristic of an individual, such as being the queen. Even in democratic societies in which gender equality is legally mandated, gender discrimination occurs in politics, both in regards to presumptions about political allegiances that fall along gender lines, and disparate gender representation within representative democracies. Historically, this was even more true when women were neither considered full citizens, nor could not vote. This section will trace the historical development of women achieving the right to vote and will then consider recent developments as women have achieved political power as representatives, in addition to being members of the voting public. Finally, we will consider assumptions made about women’s political leanings on the basis of gender. To appreciate the passing of the Nineteenth Amendment, one must look back to the mid-nineteenth century. The Seneca Falls Convention in 1848 was a single step in a broad and continuous effort by women to gain a greater proportion of social, civil, and moral rights for themselves; but was viewed by many as a revolutionary beginning to the struggle for women’s equality. Women’s suffrage took a back seat to the Civil War and Reconstruction, but America’s entry into World War I re-initiated a vigorous push. When President Woodrow Wilson announced that America needed to enter the European battlefield in order to protect democracy, women were up in arms. The National Women’s Party became the first cause to picket outside of the White House, with banners comparing President Wilson to his German adversary, Kaiser Wilhelm. The Nineteenth Amendment was passed the year following the Treaty of Paris, which ended World War I. Since gaining the fundamental right to vote in 1920, women have worked in many levels of government in the United States. In 1981, President Ronald Reagan named Sandra Day O’Connor as the first female Supreme Court justice. She was later joined by Ruth Bader Ginsburg and has been succeeded by Sonia Sotomayor and Elena Kagan. Currently, three of the nine sitting justices are women. In 1996, President Bill Clinton appointed Madeline Albright to be the first female Secretary of State, a post later given to Condoleezza Rice by President George W. Bush in 2005. Hillary Clinton is the current Secretary of State. Women in politics took center stage in the 2008 election. In the primary season, New York Senator Hillary Clinton ran against future President Barack Obama for the Democratic nomination. Although Clinton was the twenty-fifth woman to run for U.S. President, she was the first female candidate to have a significant chance of winning the nomination of a major party and the general election. As such, remarks about her gender and appearance came to the fore. Commentators noted that because she was a woman, Clinton had a sexual power that would make her too intimidating to win the national election. Comments about Clinton’s body, cleavage, choice of pantsuit, and speculation about cosmetic surgery popped up over airwaves. Many wondered if the same fixation on a candidate’s body and style would happen to a male candidate. Commentary about the role of gender in the 2008 presidential election further snowballed when Republican presidential nominee John McCain chose female Alaska Governor Sarah Palin as his vice-presidential running mate. Despite the increasing presence of women in American politics, gender stereotypes still exist. Data from the 2006 American National Election Studies Pilot Study confirmed that both male and female voters, regardless of their political persuasions, expected men to perform better as politicians than women. The only deviation in this data had to do with competency in areas such as education that are typically perceived as women’s domains and voters therefore trusted women politicians more. Because gender is considered to be a master status, or a primary trait around which individuals identify, “women” are considered to be a political demographic. In other words, “women” are supposed to have certain political priorities (usually those having to do with children and education) that unite all women as a voting bloc, or a group of individuals who tend to vote in the same way. 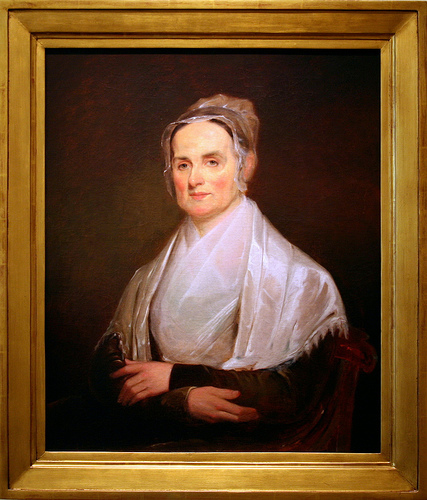 Lucretia Coffin Mott: Mott, along with Elizabeth Cady Stanton, organized the Seneca Falls Convention in 1948, effectively launching the women’s civil rights movement in the United States.